Ideal property rental at the edge of Portoroz where either the town of Piran or center of Portoroz is only a 15 minute walk away. Situated in the hillside neighborhood overlooking the Adriatic Sea to the Croatian coast, the house is close to everything. Just a 9 minute walk will take you to the promenade where you’ll find plenty of places to relax by the sea and swim, pass the time away in cafes and restaurants and playgrounds for the children. There are a couple of markets within walking distance as well. 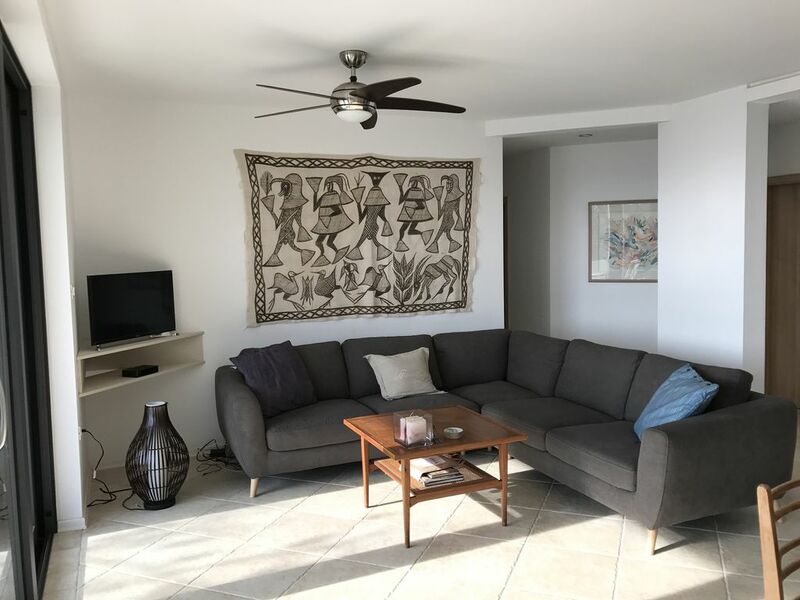 The apartments have been completely renovated with beautiful tiles throughout, rain shower heads and a bathtub in each unit and brand new kitchen appliances and cabinets. The house has two apartments each with magnificent views of the sea, private terraces and a shared pool & garden area. It is the perfect place for families with children and for those looking for privacy, peace & quiet. Free parking is provided and a garage for storing sport equipment and baby strollers. Each apartment has a BBQ and a fully equipped kitchen with a dishwasher, microwave and coffee maker. Cable TV is available in several languages (Czech, English, French, German, Italian and Slovenian) and there is free Wifi. All linen is supplied except for beach towels. Ceiling fans throughout the house and separate air conditioning and heating control in each room. You’ll love the wonderful breezes and quiet evenings. The Garden apartment is downstairs with four bedrooms and two full bathrooms and sleeps 8 (the children’s room has a bunk bed with beds that are 80 x 180 and not suitable for tall, large people). The parking for the apartment is on Vilfanova Street and is only a few steps up to the apartment. The large picture windows open up onto a large terrace where you can watch the sunrise and enjoy a glass of wine in the evening. The sea facing bedrooms also have doors that lead to the terrace. The terraced garden has a sunken pool with a Baja shelf and lots of room to relax, swim and enjoy the sun. Each unit has its own entry to the pool area – the upstairs unit has stairs that lead on the West side of the house and the downstairs unit has steps that lead to the pool area from their terrace. Both apartments can be rented for family & friend reunions and a discount is available. Please contact us for details. Roman & Kathi live in Prague, Czech Republic and have another vacation rental property they have been renting out for three years. They love to travel and meeting new people and love sharing experiences and places to visit. We love Slovenia and especially the coast. We have another property that we rent on VRBO and decided to buy another place with our family. This house is located in a quiet residential area and is just minutes from the sea. We love the area and the people of Slovenia. Our family and we completely reconstructed the house and put in a swimming pool and new landscape. There are 20 olive trees on the property and this year we picked and processed our olives for our own olive oil! We love it here. The sea is about an 8 minute walk away. Quiet neighborhood in the hills overlooking the Adriatic Sea and Croatia. Views of the Sea from the terrace and pool area. Boat rentals are available in Bernardin which is a 10 minute walk from the house. There are additional boat rentals options in Piran and Portoroz. Windsurfing, scuba diving and jet skis can be rented as well as other water sport activities. Great appartment, great pool and terrace, great views. Lovely appartment with everything you could wish for an enjoyable holiday. Traumhafte Lage, sehr sauber und großzügige Unterkunft. Super Pool. Sehr freundlicher Vermieter. Empfehlenswert!!! Alles top! Sehr zu empfehlen. Sehr schöne Ferienwohnung mit sehr guter Ausstattung in super Lage! Wir hatten einen wunderbaren Urlaub im Sea View Garden Apartment in Portoroz - ist jedem nur zu empfehlen, der gerne mit Freunden/Familie eine tolle Zeit am Meer verbringen möchte. Das Haus ist super schön, der Garten traumhaft und der tolle Pool lädt zum Plantschen ein ;D.
Thank you Denise! We're so happy that you had a nice time and that you enjoyed your stay! It was wonderful having you and your family stay and we look forward to your visit again! Check in time is 4:30 pm Check out time is 10:00 am Tourist tax is included in the rental rates Pets are considered. Please contact us.